As a result of the EU-Singapore Free Trade Agreement (“EUSFTA”) which was inked by Singapore and the EU in Brussels on October 19, 2018, the way was paved for a high level of protection for GIs in Singapore. Singapore's new GIs Registry will be accepting applications from 1st April 2019. Applications will be processed in the same way as trademark applications and will undergo substantive examination and be published for opposition purposes. (iii) A competent authority having responsibility for the GI concerned. (vi) Evidence that the GI has been registered or obtained recognition as a GI in the qualifying country of origin (where the GI relates to a qualifying country other than Singapore). Francine Tan Law Corporation is honoured to be the first associate member from Singapore of oriGIn (The Organization for an International Geographical Indications Network), an NGO based in Geneva. oriGIn represents about 500 associations of producers and other GI-related institutions from 40 countries. 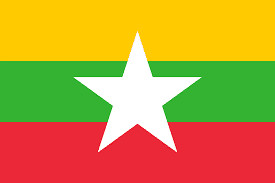 The Myanmar Parliament passed the long-awaited Myanmar Trademark Law and Industrial Design Law on 30th January 2019. The laws will come into effect after the President of Myanmar issues a notification. The introduction of these laws will bring about a proper regime and infrastructure for the registration of trademark and design rights. Till now, brand owners have only had the option of registering declarations of ownership of trade marks with the Registry of Deeds and Assurances and publishing cautionary notices in local newspapers to put the public on notice of claims to proprietary rights ("the old regime"). No substantive examination of these "trademark registrations" were ever undertaken. A Myanmar IP Office ("MIPO") will be established under the auspices of the Ministry of Commerce. A first-to-file system will apply for trademark registrations. Trade marks including well-known marks, collective marks, Geographical Indications, certification marks and new and original industrial designs will be given protection. Trademark registrations will be valid for a term of 10 years and can be renewed for further 10-year periods. Design registrations will be valid for 5 years and renewable for further 5-year periods up to a maximum of 15 years. Existing "trademark registrations" under the old regime will have to be refiled with the MIPO as those registrations will not be recognised under the new Trademark Law. It is therefore advisable for brand owners to review their portfolio of marks and take preparatory steps in advance so that timely instructions may be provided to file trademark applications with the MIPO once the new regime goes live. Please feel free to contact us should you have any questions or need assistance with trademark protection in Myanmar. A contribution Francine made to Connected Women in the lead up to International Women's Day. 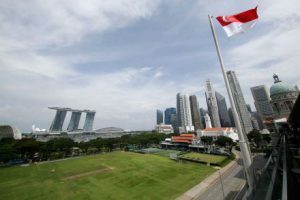 Will Singapore Stay Ahead of the IP Game? Read Francine's opinion piece which was published in Singapore's Business Times. 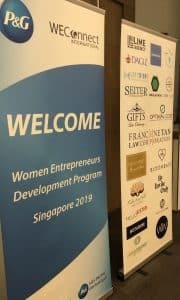 Francine is honoured to be one of 20 women business owners selected to participate in a 10-module training program that was launched for the first time in Singapore and will be conducted at P&G's Singapore Innovation Centre. The program aims to empower women entrepreneurs and covers topics on business development and growth strategies as well as leadership and communications skills. 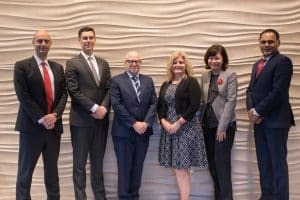 The kick-off ceremony on February 12th, 2019 was attended by representatives from the US Embassy, WEConnect International and P&G Global. With effect from 15 April 2019, IPOS will cease to require applicants to provide English translations and transliterations of foreign words/characters appearing in trade marks. The filing process will be simplified and automated. Where the auto-generation of translations is not possible, only then may IPOS request applicants to provide the translation and/or translation documents. IPOS will also discontinue the practice of endorsing trademark applications with transliteration and translation clauses. Plain Packaging and Brand Restrictions: The Start of a Slippery Slope? Read a summary of the round table panel discussion on Plain Packaging and Brand Restrictions - WTO's Upcoming Decision and the IP Perspective which took place on February 26, 2018 at Maxwell Chambers. The event was co- hosted by INTA, Soroker Agmon Nordman Pte Ltd, and Francine Tan Law Corporation. We were honoured to have the President of INTA, Ms Tish L. Berard, grace the occasion with her presence and sharing INTA's position on brand restrictions. See Francine Tan's comments in the WTR March 2018 article - Singapore's timid local trademark scene belies its branding strength: exclusive data analysis.